Die jüngsten BIP-Zahlen des Office for National Statistics zeigen nicht nur eine mäßige Wachstumsrate von 0,2 Prozent im vierten Quartal 2018, sondern auch eine Rezession im verarbeitenden Gewerbe. Wie unsere Grafik zeigt, hat das negative Wachstum in den letzten beiden Dreimonatszeiträumen 2018 von -0,70 Prozent bzw. -1,50 Prozent gegenüber dem Vorjahr die wichtigste Wirtschaftssäule in ernsthafte Schwierigkeiten gebracht. 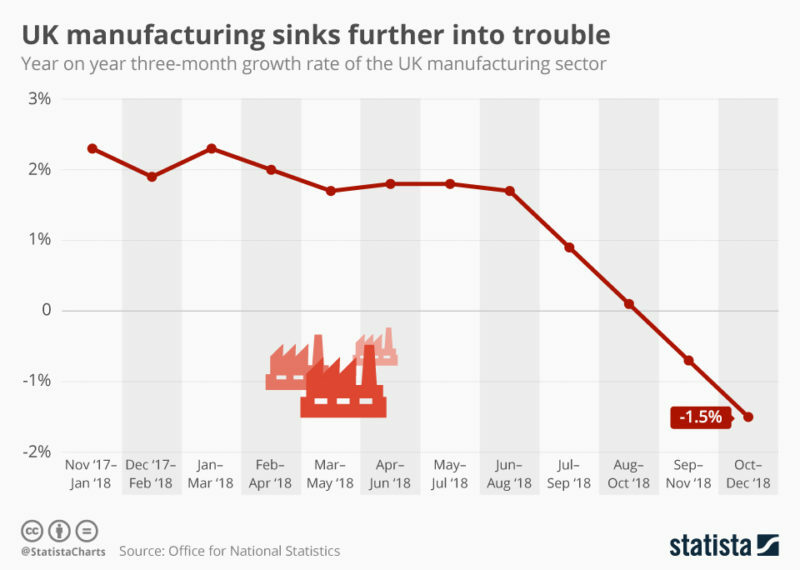 As well as delivering news of a measly 0.2 percent growth rate in Q4 2018, the latest GDP figures from the Office for National Statistics revealed a manufacturing sector in a recession. As our chart shows, negative year-on-year growth in the last two three-month periods of 2018 of -0.70 percent and -1.50 percent have plunged the key economic pillar into serious trouble. Commenting on the latest results, Frances O’Grady, general secretary of the TUC, said: “The prime minister’s failure to rule out a no-deal Brexit is harming confidence in the economy and holding back growth…With our manufacturing sector in recession, the prime minister must act now to remove the threat of crashing out.”.